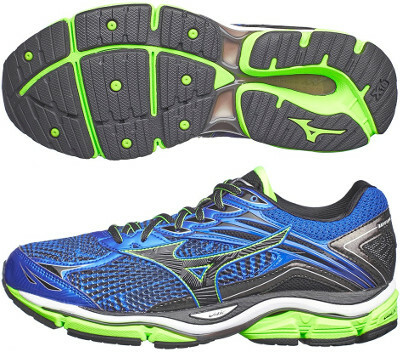 Mizuno Wave Enigma 6 are neutral cushioned running shoes. The Mizuno Wave Enigma 6 faces the challenge to continue the great sales performance from its preceding edition as well as its smaller sibling Wave Ultima 8. As the premium running shoe from the japanese brand the Enigma 6 is plenty of cushioning from most innovative materials, a great choice for neutral runners to enjoy long distances. Major change compared to its predecessor the successful Wave Enigma 5 is the redesigned reinforcements over the new luxurious Viscotech mesh which promises more comfort and breathability than usual AirMesh. Internal strips (Dynamotion Fit) have been reengineered to provide snugger, custom fit. Reflective elements have been improved for increased visibility under poor light conditions. Midsole construction in Wave Enigma 6 has replaced the typical EVA layer on top (just below sockliner) with innovative U4icX™ for softer sock absorption and great comfort targeting heel strikers. Rest of midsole platform includes full length Wave™ between U4ic™ (top) and U4icX™ (bottom) featuring maximum cushioning and good response. Some extra rubber has been added in outsole's forefoot which keeps its design with deep grooves for extra flexibility providing smoother ride. As in many other Mizuno models, X10 rubber is used in more exposed areas to increase durability.